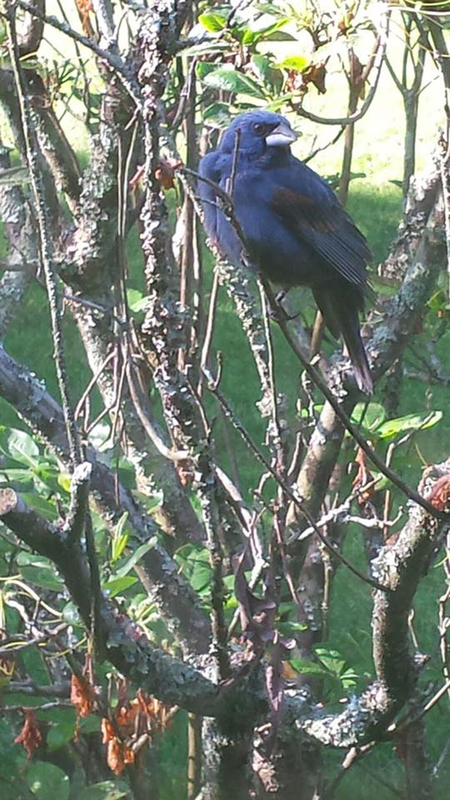 Daryl Herron, a real-life friend as well as a Facebook one, posted a photo of a bird on my page recently, seeking help with identifying the bird. His sister, Monica Cody, took the photo at her Kingsport home. The stunning bird depicted in the photo, as I happily reported back to Daryl, was a blue grosbeak. The grosbeak is an impressive bird, with males showing off an overall blue plumage save for some brown and black feathers in the wings. Blue grosbeaks are mostly southern birds with Tennessee, Kentucky and Virginia representing the northern tier of this bird’s range in the southeastern part of the country. Look for these chunky, blue birds in brushy fields or along hedgerows in fairly open country. They favor the same habitats as such birds as yellow-breasted chat, brown thrasher and loggerhead shrike. Photo by Monica Cody This male blue grosbeak showed up near Monica Cody’s home in Kingsport, Tennessee. The blue grosbeak is an uncommon visitor in the region. It’s a shame this bird isn’t more common in the region. Blue grosbeaks will visit feeders, but in more than 20 years of maintaining well-stocked feeders, I’ve managed to attract only one of these birds. If more common, it would surely be a favorite bird among the people offering free seed for their feathered friends. The blue grosbeak is related to the better-known rose-breasted grosbeak. Male rose-breasted grosbeaks are absolutely stunning, especially for people getting their first-ever glimpse of this bird. It’s the adult male with his vibrant black and white feathers and the large rosy-red splash of color across the breast that gives this bird its common name. Females are brown, streaked birds that are larger than but easily confused with some of our sparrows. Among grosbeaks, both sexes have a massive bill, which they use to hull sunflower seeds at feeders or glean insects from leaves and branches. It’s the heavy, blunt bill for which the term “grosbeak” is derived. “Gros” is a German term for large or big, so grosbeak simply means a large-beaked bird. People who band birds to further the study of them will tell you that rose-breasted grosbeaks have a wicked bite and are capable of delivering quite a nip. Bird banders in the region frequently encounter rose-breasted grosbeaks in their mist nets — and some bear the scars to prove it. Photo by Tammie Kroll The male rose-breasted grosbeak is probably one of the least difficult songbirds to identify with his unmistakable plumage pattern. 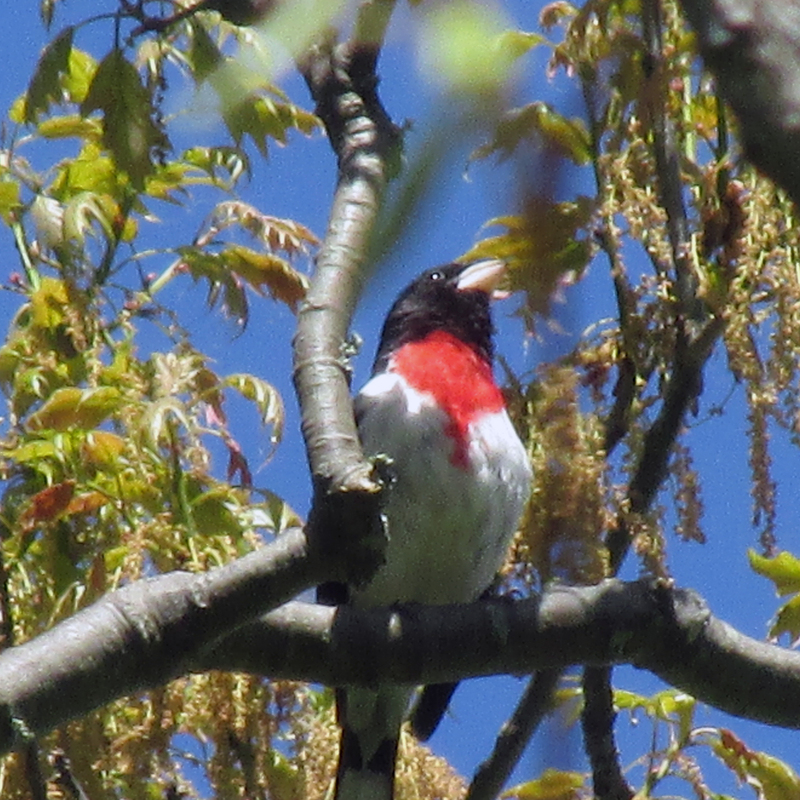 The spring arrival of rose-breasted grosbeaks is usually a fleeting visit. Finding suitable arrangements, which can consist of well-stocked feeders and perhaps a convenient water source, the migrating birds may linger for several days. These birds nest at higher elevations, however, and are usually impatient to continue the journey to where they will spend the summer months tending to their young. This spring, Tammie Kroll was one of the lucky people to receive visits from rose-breasted grosbeaks. 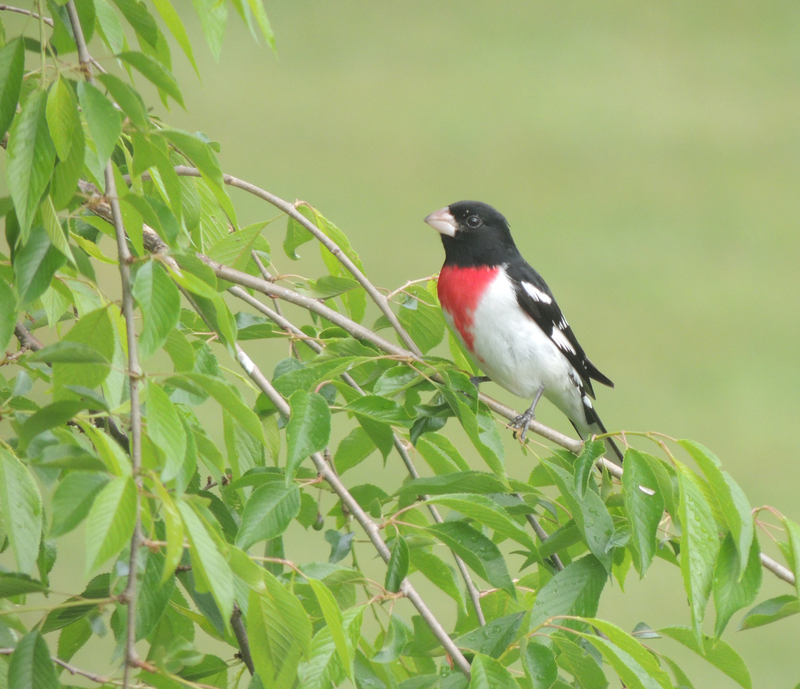 Tammie emailed me to share a beautiful photo she took of the male grosbeak that visited her home in Washington County, Virginia, near Exit 13 off Interstate 81. There’s good news for those who didn’t receive springtime visits from these pretty birds. The rose-breasted grosbeak is also a common fall migrant and can again be attracted to yards offering sources of food and water. While males usually don’t look quite as dramatic by August and September, they’re still sure to cause a stir when visiting a feeder. Photo by Bryan Stevens A rose-breasted grosbeak sings from a tree on Roan Mountain, Tennessee. Plenty of rose-breasted grosbeaks pass through northeast Tennessee, southwestern Virginia and western North Carolina, and a few even decide to make their summer homes in the mountains in these regions. However, these birds spread out widely across the eastern half of the North American continent, ranging from northeastern British Columbia to Quebec and Nova Scotia in Canada. They also range south from New Jersey to Georgia. 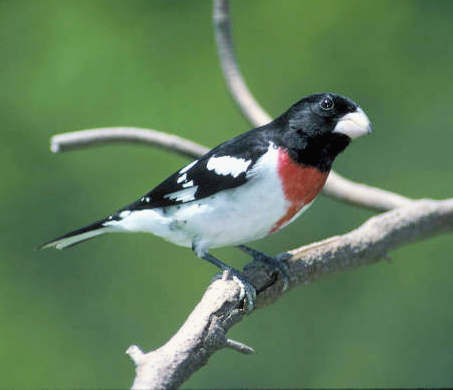 The rose-breasted grosbeak also reaches Colorado, Oklahoma and Kansas. 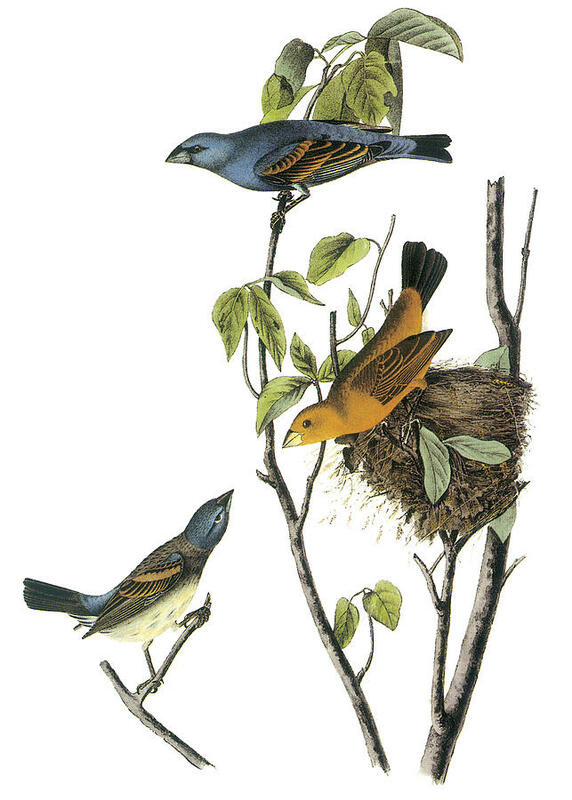 John James Audubon painted this family of blue grosbeaks. For the most part, however, the rose-breasted grosbeak is replaced in the western United States by the closely related black-headed grosbeak. I saw several of these birds during a trip to Salt Lake City, Utah, back in 2006. Other grosbeaks in the United States include the evening grosbeak and pine grosbeak. In the American tropics other grosbeaks are found, including the descriptively named yellow-green grosbeak, crimson-collared grosbeak, ultramarine grosbeak and yellow-shouldered grosbeak. This entry was posted in Birding, Birds, Black-headed grosbeak, Blue grosbeak, Fall migration, Grosbeaks, Rose-breasted Grosbeak, Tennessee and tagged Birding, birds, Black-headed grosbeak, Blue grosbeak, Bristol Herald Courier, Bryan Stevens, Carter County Compass, Elizabethton Star, Erwin Record, Feathered Friends, Grosbeaks, McDowell News, Our Fine Feathered Friends, Rose-breasted Grosbeak, The Erwin Record on September 4, 2016 by Bryan Stevens.